Prohibits existing LSLs as of June 28, 2017 and provides an automatic grace period to all property owners. The requirement to remove the private LSL is triggered when the City serves notice to the owner that they need to replace the LSL. The owner must choose within 30 days to replace the LSL at their own cost with their own contractor in coordination with GCWW, or, to contract with GCWW to complete the work. Any unpaid costs after deduction of GCWW cost-sharing can be assessed to the property. In contrast, Madison’s ordinance did not prohibit existing LSLs and used the notice to trigger an investigation and extended replacement schedule. Requires landlords to inform prospective tenants in writing prior to the tenant’s signing the lease if the unit is serviced by an LSL. Landlords are directed to the GCWW’s webpage to check records of the material composition of their service line. The City provides a useful interactive map. Cincinnati is the first community we are aware of that alerts prospective tenants about LSLs so they can consider the risks before signing the lease. Establishes a “Help Eliminate Lead Pipes” (HELP) fund to handle donations from City employees, GCWW customers, corporations, and others to assist low-income residential property owners with the cost of replacement of LSLs on private property. Cincinnati’s ordinances are a follow-up to its October 2016 directive to GCWW to develop an LSL replacement program that 1) replaces all lines within 15 years, 2) uses property assessment as a financing option; and 3) sets up a customer assistance program. GCWW plans to replace the water main that connects to the LSL. 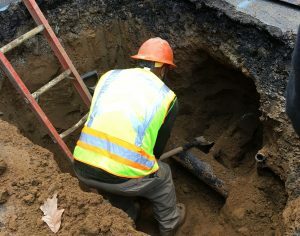 The ordinance prohibits the utility from reconnecting the main to existing lead pipe. This provision effectively bans partial LSL replacement. An existing LSL is leaking. The line can be temporarily repaired but then must be replaced with copper. LSL is disturbed for any other reason such as renovation, demolition and rebuild. The cost sharing with GCWW is only available if the work is performed by GCWW or its contractor. This approach enables the City to manage the cost and ensure the work is done properly and efficiently. Low-income residents who are senior citizens will be asked to pay half the cost of replacement. If the resident property owner is low income but not a senior citizen, they pay 55% of the cost. All other property owners pay 60%. GCWW’s maximum cost share is $1,500. GCWW has the flexibility to prioritize LSL replacement based on the public health risk and economic consideration and anticipates putting any school, child care provider, or other business or activity frequented by children as a high priority. The three ordinances only provide the legal framework and the resources for the City to successfully replace all LSLs. The difficult work of implementation falls largely on GCWW and not all property owners will appreciate the need to replace lead pipes. A key to success is the HELP fund to minimize the burden on low-income property owners. With these cautions, we think the approach is a model that should be considered by other communities. This entry was posted in Drinking Water, lead, States and tagged Cincinnati, lead, Lead in Drinking Water, Lead Service Lines. Bookmark the permalink. Both comments and trackbacks are currently closed.